ADJ is pleased to introduce the latest evolution in the hugely popular Mega Par Series of affordable LED-powered wash lights. 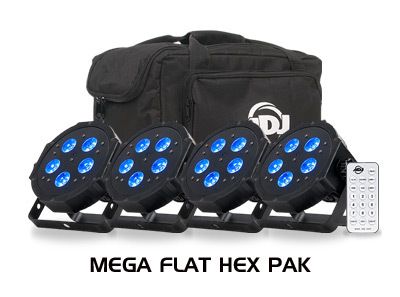 Featuring ADJ’s patented ‘sit-flat’ design, the Mega Hex Par combines powerful 6-in-1 HEX color LEDs with useful features – including a bundled IR remote – to create the ultimate portable par fixture. The compact, low profile Mega Hex Par is designed for both up-lighting and stage lighting applications. 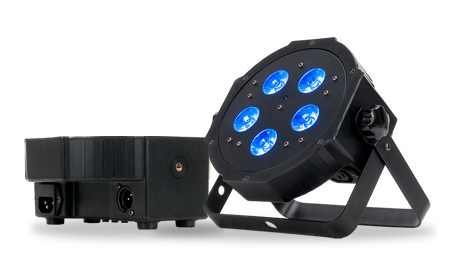 It features 5 x 6-Watt HEX (RGBAW+UV) LEDs that allow smooth color mixing and a huge color palette, which is much wider than those offered by tri and quad LED models. The inclusion of the UV element also means that the fixture can create a classic ‘UV glow’ effect when used alone as well as exciting UV-infused colors – such as hot pinks, lime greens and electric blues – when combined with the other LED elements. The Amber and White LED elements also mean that the fixture is capable of generating white light at varying color temperatures, which makes it ideal for stage illumination. 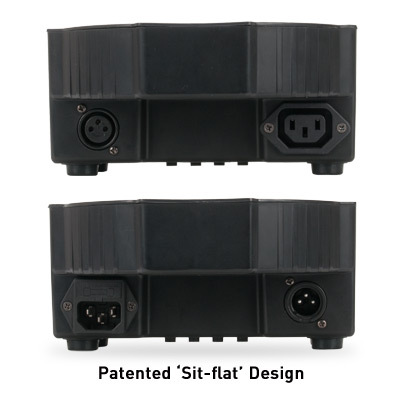 Thanks to ADJ’s patented ‘sit-flat’ design, the Mega Hex Par may be placed directly on the ground or inside a truss because its power and DMX input and output sockets are mounted on the sides of the fixture, not on the rear. These sockets are also grouped together, with the inputs on one side and the outputs on the other, to make cabling easier and neater. The included flexible two-part scissor yoke means that the unit can also easily hang from a truss or stand on the floor locked into place at any desired angle. The Mega Hex Par has a beam angle of 25-degrees, making it ideal for architectural wall-washing as well as stage lighting applications. Its efficient LED light-source produces minimal heat, where traditional stage lighting produces a lot of excess heat, which allows the temperature on stage to be kept cooler for the comfort of performers. Another advantage of LEDs is their long lamp life. The Mega Hex Par’s LEDs have a working life of 50,000 hours, which makes lamp replacement a thing of the past! With five operational modes to choose from, the Mega Hex Par is suitable for all kinds of events and productions. Static Color mode allows quick and easy selection of any of the unit’s 63 pre-programmed color macros, while RGBAW+UV Dimmer Mode allows any combination of the six LED elements to be mixed directly from the LED display on the rear of the fixture. To allow dynamic lighting effects to be created, the unit also features a variety of in-built chase patterns. Auto Run Mode allows a choice of 16 Color Fade patterns, 16 Color Change patterns and a combined pattern to be selected to run at a set speed. Alternatively, Sound Active Mode allows 16 different chase patterns to be set to run triggered by the beat of the music detected by an internal microphone. Multiple fixtures can also be linked together using XLR cables for synchronized color chases in a Master/Slave configuration. For remote control, the Mega Hex Par is supplied with an ADJ UC IR wireless remote. This can be used to control Black Out, Full On, Strobe, Dimming, Sound Active and Color Change functions. The fixture is also supplied with an ADJ Airstream IR transmitter that can be used to control the same functions using the ADJ Airstream IR App running on an iPhone or iPad. Finally, for full remote control of all of its features, the unit can also be operated using the DMX-512 protocol with a choice of five channel options (6, 7, 8, 11 or 12). Due to its low-profile design and lightweight – yet robust – housing, the Mega Hex Par is extremely easy to store, transport and setup. Weighing in at just 4 lbs. / 1.87 kg and with dimensions of 10.25” x 10.25” x 4.25” / 261 x 260 x 110mm (LxWxH) it is a compact fixture that is also extremely potent. Mega Hex Par units are available individually, while the Mega Flat Hex Pak bundles together four of the fixtures with a collection of accessories to create a complete all-inclusive up-lighting / stage washing package. This includes four 3ft. / 1M power cables, three 6 ft. / 2M DMX cables, a UC IR wireless remote and a padded carry case. The Mega Hex Par and Mega Flat Hex Pak are available now from ADJ USA and will soon be available from ADJ subsidiaries and distributors world-wide.